Palmer, Howard and Leo Driedger. "Prejudice and Discrimination in Canada". The Canadian Encyclopedia, 12 December 2018, Historica Canada. https://www.thecanadianencyclopedia.ca/en/article/prejudice-and-discrimination. Accessed 21 April 2019. Prejudice refers to an unsubstantiated, negative pre-judgment of individuals or groups, usually because of ethnicity, religion or race. Discrimination is the exclusion of individuals or groups from full participation in society because of prejudice. 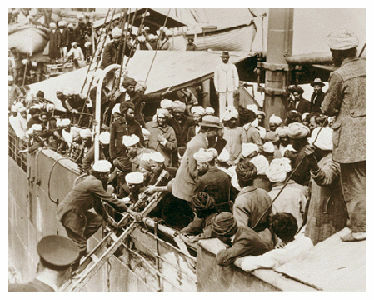 In 1914 the arrival of the Komagata Maru in Vancouver with East Indian immigrants touched off violent demonstrations in Vancouver. As a result they were refused entry (courtesy Vancouver Public Library). Prejudice refers to an unsubstantiated, negative pre-judgment of individuals or groups, usually because of ethnicity, religion	or race (see Racism). Discrimination is the exclusion of individuals or groups from full participation in society because of prejudice. Despite Canada's long history of prejudice and discrimination, efforts have been made in recent generations to make the country a mosaic of peoples and cultures. Equality is constitutionally protected today by the Charter of Rights and Freedoms. Prejudice in Canada dates back to the beginnings of its settlement. It can be seen in the relations between Indigenous peoples and European colonizers that arose in the 17th and 18th centuries (see Slavery of Indigenous People in Canada). The European view of Indigenous peoples was complex and ambivalent, ranging from seeing them as "noble savages" to considering them soulless barbarians. While there were significant differences in Indigenous-French and British-Indigenous relations in pre-Confederation Canada, in both cases the economic interests of the fur trade helped to cement a tolerable working relationship between the colonizers and Indigenous peoples (see Indigenous Peoples: Treaties). Large-scale settlement, however, led to deterioration in relations as Indigenous peoples became perceived as an impediment rather than an aid to economic development. As a result of early European settlement and the subsequent British Conquest in 1759-60, as well as the geographical isolation of Indigenous populations, Indigenous-European relations gradually became less important than the relations between the colonizing powers. The economic, political, social and religious co-operation and rivalries between British and French settlers shaped much of Canada's development from the 1750s to the present. Prejudice and discrimination existed on both sides. Because the two groups shared a technologically-based Western culture, the nature of their relationship and the kinds of prejudice and discrimination that characterized it were considerably different from those that characterized Indigenous-settler relations. The number of people in Canada other than those of British, French or Indigenous origin remained small until the end of the 19th century, when large waves of immigrants arrived, settling primarily in the West. Most English-speaking Canadians saw this non-British and non-French immigration primarily as a way of speeding Canada's economic development. Others, however, worried about the social and economic impact of non-British immigration and opposed an open-door Immigration Policy. French-speaking Canadians opposed it on the grounds that such a policy would further erode the status of French Canada within Confederation. Most English-speaking Canadians shared prejudices concerning the comparative desirability of immigrant groups. During the late 19th and early 20th centuries, the belief in progress and in white superiority was taken for granted throughout the Western world. Many English-speaking Canadians believed that Anglo-Saxon peoples, and British principles of government, were the apex of biological evolution and that Canada's greatness depended on its Anglo-Saxon heritage (see Imperialism). Their assessment of a group's desirability therefore varied almost directly with the degree its members conformed to British culture and physical type. British and American immigrants were regarded as the most desirable, followed by northern and western Europeans, central and eastern Europeans and then by Jews and southern Europeans. Close to the bottom of the pecking order were the pacifist religious sects, such as the German-speaking Hutterites and Mennonites, and the Russian-speaking Doukhobors. These groups were invariably lumped together by public officials and the general public. Their social isolation made their assimilation difficult. Their thrift and industry made them strong economic competitors, and their pacifism	raised doubts about their commitment to Canada. Last in the pecking order were blacks and Asian immigrants — Chinese, Japanese Canadians	and South Asians — who were considered inferior and unable to be assimilated into Canadian society. Black Canadians	encountered significant prejudice in the pre-Confederation era. Although there were many who opposed it, slavery existed in New France and British North America. By the 1860s, the 40,000 black people in Canada included descendants of slaves in New France, Loyalists, Jamaican Maroons, American refugees from the War of 1812, and fugitives who came to Upper Canada to escape slavery. Many Canadians opposed slavery on moral grounds and assisted refugees from the United States. But many others feared the influx of black settlers, seeing them as backward, ignorant, immoral, criminal and an economic threat. Black people were treated primarily as a source of cheap labour. Following the final abolition of slavery throughout the British Empire in 1833, black Canadians encountered fewer legal barriers, but still faced a great deal of social prejudice. Some of the most widespread legalized patterns of discrimination occurred against Asians settling in British Columbia, where anti-Asian sentiment was endemic from the 1850s to the 1950s. Asians were regarded as alien and inferior. Organized labour groups claimed Asians took jobs from whites and lowered living standards for all workers because they were willing to work for less money than white workers. Asians were excluded from most unions, and as a matter of policy employers paid Asian workers less than others. Because of discriminatory legislation and social practices in BC, Chinese, Japanese and South Asians could not vote, practise law or pharmacy, be elected to public office, serve on juries, or have careers in public works, education or the civil service. Public opinion on Asian immigration was expressed on several occasions in violent anti-Chinese and anti-Asian riots. The most serious riots were in Vancouver in 1887 and 1907. Various attempts were also made by anti-Asian groups to exclude Asians from public schools, to restrict the sale of land to Asians and to severely limit the number of licences issued to Japanese fishermen. In 1892 and 1907 smaller scale anti-Chinese riots also occurred in Alberta, Québec, Nova Scotia and Saskatchewan when legislation was passed prohibiting white women from working in restaurants, laundries and any other businesses owned by Chinese or Japanese Canadians. Black Canadians also faced a similar widespread pattern of discrimination in housing, employment and access to public services during the late 19th century and early-to-mid-20th century. They had difficulty being served in hotels and restaurants, and in being admitted to theatres and swimming pools. On occasion they were forced into segregated schools, particularly in Nova Scotia and Ontario, where black Canadians were most concentrated. The discrimination against blacks occasionally erupted into violence. In both world wars, armed forces units were reluctant to accept blacks, Chinese, Japanese and South Asians, although some from each group did eventually serve. Meanwhile, Chinese immigration was curbed by a "head tax" and was stopped altogether by the Chinese Immigration Act of 1923. A gentleman's agreement was made with Japan in 1907, restricting the number of Japanese immigrants. An Order-in-Council	banned immigration from India in 1907. The government also introduced restrictive immigration laws in 1906, 1910 and 1919 to control European immigration. Between 1896 and the Second World War, French Canadian nationalists charged that large-scale immigration (particularly since little of it was French-speaking) was an English Canadian plot to undermine the status of French Canada. Immigration was not as significant a public issue in Québec as it was in Ontario and the West because so few immigrants settled there. However, by 1914 Jews in Montréal	were the victims of strong anti-semitism, much of it stemming from the religious bias of French Canadian Nationalism. Jews were depicted as exploiters, as threats to Christian morality and civilization, and as symbols of the evils of internationalism, Liberalism, bolshevism, materialism and urban life. Public controversies involving both the French and British in Montréal emerged over the Jews' place in the denominationally-based school system and over Sunday-closing legislation. Antagonism toward Jews was expressed by occasional cemetery desecrations and street fights. The French Canadian hostility toward Jewish immigration was paralleled by the hostility of ultra-Protestants in English-speaking Canada. This group regarded Catholic	immigrants from Europe as subservient tools of Rome and potential political allies of French Canadian Catholics. The ethnic stereotypes of turn-of-the-century Canada emphasized the peasant origins of central, eastern and southern Europeans and Asians. It depicted immigrants as poor, illiterate, diseased, morally lax, politically corrupt and religiously deficient. The alleged tendency of central and southern Europeans for drink, violence and crime and of the Chinese for drugs, gambling	and white women were powerful and popular images with the dominant society. Ethnic slurs were widely used in the pre-1950s era. Discrimination was one of the factors that led to a vertical mosaic of occupations and incomes in Canada. People of British descent were at the top and so on down to Chinese and black Canadians who occupied the most menial jobs. Non-British and non-French groups had very little economic power, and they did not begin to make any significant inroads into the middle echelons of politics, education or the public service	until after the Second World War (see Elites). The levels of prejudice and discrimination against non-white minorities reached comparable levels for white immigrants only during periods of intense nationalism generated by war. During the First World War, Germans and immigrants from the Austro-Hungarian Empire were victims of prejudice and persecution. "Enemy aliens" were dismissed from their jobs. Some were placed under police surveillance or in internment camps. Their language schools and many of their churches were closed; their newspapers were first censored and then gradually suppressed; and during the war, rioting soldiers and civilians attacked the premises of German clubs and German-owned businesses. Loyalty and cultural and linguistic uniformity were assumed to be synonymous. Opposition to pacifist religious sects also intensified during the war. It eventually led to a 1919 order-in-council (rescinded during the 1920s) that specifically barred the entry of members of these groups into the country. From 1919 to 1953 Doukhobors in BC were denied the right to vote, and this prohibition was extended to the federal level from 1934 to 1955. The return of First World War veterans, and the postwar economic depression, brought hostility toward pacifist sects to a peak and contributed to beliefs that immigrant political radicals posed a threat to Canadian life. Slavic immigrants were no longer perceived as "stolid peasants”, but as dangerous revolutionaries. By the early 1920s, central, southern and eastern European immigrants were officially classified among the "non-preferred" and restricted categories of immigrants. In the mid-1920s, however, in response to public pressure, the federal government loosened restrictions on immigration from Europe as a way of promoting economic development. During the late 1920s the federal government allowed more than 185,000 central and eastern Europeans and Mennonites	into Canada as farmers, farm labourers and domestics. This new wave of immigration re-awakened prejudices. Organizations such as the Ku Klux Klan (KKK), the Native Sons of Canada and the Orange Order	criticized the new immigrants as a threat to Canada's "Anglo-Saxon" character. Several of the organizations, particularly the KKK, also opposed Catholic immigrants. The Klan began organizing in Montréal, Ontario, BC and Manitoba in the early 1920s. Its membership in Saskatchewan in the late 1920s reached 20,000. The Klan organized boycotts of Catholic businessmen, intimidated politicians who seemed sympathetic to French or Catholic interests, opposed federal immigration policy, opposed Catholic schools, and tried to prevent interracial and Catholic-Protestant	marriages. The Klan was sufficiently powerful in Saskatchewan to contribute to the defeat of the Liberals in the 1929 provincial election. A vicious cycle of prejudice and discrimination became further entrenched during the 1930s. The discrimination that non-Anglo-Saxons encountered led them to support radical political movements such as communism (see Communist Party) and Fascism, and this in turn reinforced discrimination against them. Between 1930 and 1935, Prime Minister R.B. Bennett	used deportation as a way of thwarting support for the communists. In labour conflicts in western Canada and Ontario during the Great Depression, a predominantly non-Anglo-Saxon workforce was frequently pitted against an Anglo-Canadian management that attempted to destroy labour solidarity and discredit the strikers by stressing their foreign origins. During the 1930s Jews were targets of social discrimination, through informal residential restrictions, quotas in university professional schools, and exclusion from elite social clubs, beaches and resorts in Montréal, Toronto	and Winnipeg. Anti-Semitism also influenced immigration policy. Canada closed its doors to Jewish immigrants at the time when they desperately needed refuge from Nazi persecution in Europe. During the Second World War, German and Italian Canadians, and members of pacifist sects also encountered hostility. In rural BC during the 1920s and 1930s popular prejudice against the Doukhobors was reinforced by wartime attitudes. In 1942 the Alberta government passed a law banning all land sales to Hutterites for the duration of the war, and from 1947 to 1972 Alberta legislation restricted the amount of land Hutterite colonies could own, and the areas of the province into which they could expand. A number of developments during and after the war also undermined certain prejudices against various minority groups. Chinese and Ukrainian Canadians won new respectability through their support for the war effort. The involvement of all levels of society in wartime industries undermined social barriers. And revulsion against Hitler and Nazism eventually prompted reactions against Hitler's concept of a superior race, and against public expressions of anti-Semitism. Canada's signing of the United Nations charter in 1944 and the Universal Declaration of Human Rights in 1948 brought Canada's discriminatory policies into glaring focus. Following intense lobbying by Asian groups and an increasingly sympathetic public, Asians were finally given the vote in Canada (South Asians and Chinese in 1947, Japanese in 1949). The ban on Chinese and South Asian immigration was repealed, although only wives and children of existing Canadian citizens were eligible for immigration. Immigration after 1945 was still biased in favour of Europeans, although the government allowed a small quota of immigrants from India, Pakistan and Ceylon (1951). Postwar immigrants were better accepted, partly because many were educated and skilled. Probably the main reason behind the new tolerance toward immigrants in the 1950s and 1960s — exemplified by the passage of provincial human rights bills and codes, the federal Canadian Bill of Rights (1960), and the creation of human rights commissions — was the erosion of the assumptions and respectability of Anglo-Saxon racism. This resulted from a revulsion against Hitler's racism, the decline of Britain as a world power, and the growth of the American civil rights movement. The prosperity of the 1950s and 1960s facilitated the upward socio-economic mobility of second- and third-generation non-Anglo-Saxon Canadians. It also helped weaken the fairly rigid relationship between class and ethnicity. The recommendations of the Bilingualism and Biculturalism Commission and the introduction of a more just Immigration Policy	in the 1960s — as well as the increasing globalization of the 1970s — resulted in a shift from largely European immigration to a greater inflow of Asian immigrants. The 1971 census showed that about 95 per cent of the Canadian population comprised those of European heritage, and it was hard to find more than five per cent who could be considered non-European. Only 25 years later in 1996, the non-European, non-white visible minority population had doubled to 11 per cent. Attitudes toward Indigenous peoples in the 19th and 20th centuries paralleled in many ways those toward immigrants and other ethnic groups. Treatment of Indigenous peoples, however, was tempered by their special standing and legal status embodied in the treaties and the Indian Act, which fostered a paternalistic approach by governments that has not yet entirely ended. The pre-Confederation notion of Indigenous peoples as military allies or partners in the fur trade was gradually supplanted by the view of them as backward stumbling blocks to progress. Governments isolated them on reserves	and, in conjunction with the major Christian denominations, attempted to assimilate them through the introduction of European agriculture, education and Christianity. Although many Indigenous children received educations in government funded, church-run residential schools, thousands were also abused, sometimes physically and sexually, and many more lost their language and culture in the schools. As with the new immigrants, it was thought that Indigenous languages and cultures must be eradicated and that they would have to be assimilated into a superior way of life. To the consternation of government Indian agents and missionaries, Indigenous people were occasionally encouraged to display their culture for visiting dignitaries or at local fairs, but these displays were viewed as quaint remnants of the past rather than as an integral part of the developing Canadian society. Ironically, during the First World War the government, in order to increase enlistments, began to encourage the warrior ethic among Indigenous people in Canada which it had been trying for decades to suppress (see Indigenous Peoples and the World Wars). This ended quickly at war's end, as the federal authorities expected Indigenous veterans to return to the same inferior legal, political, social and economic status that they had endured before the war. Like most non-white immigrants, Indigenous peoples could not vote, were relegated to the bottom rungs of the economic order and were socially stigmatized (see Indigenous Suffrage). Through the interwar period, Indigenous people ceased to be major points of public debate. Their powerlessness, lack of economic competition and geographic isolation contributed to their absence from public attention. Unlike Asians and blacks, who were largely excluded from coming to Canada during this period, Indigenous people could obviously not be excluded from the country. The post-Second World War period led to new developments in Indigenous relations that paralleled some of the changing attitudes toward immigrants and non-British and non-French ethnic groups. Indigenous peoples gradually became more educated and better organized, and a number of Indigenous spokespeople began to challenge their second-class status. In 1960 the Diefenbaker	government ended the discriminatory measure that prevented Indigenous peoples from voting federally. The public became more sensitive to Indigenous values and culture. Assimilation programs came into disrepute and governments began to promote pride of ancestry, social and economic advancement, and language and cultural retention for both immigrant minorities and Indigenous peoples. One turning point was the strong opposition to the federal government's White Paper of 1969, which proposed to terminate Indigenous peoples' special status. In response to this opposition, the federal government disavowed its assimilationist policy. As they increasingly moved to urban centres after the 1950s, Indigenous people still encountered prejudice and discrimination in housing, restaurants and other public facilities; however, human rights legislation offered some recourse. Governments professed a desire for new approaches in dealing with Indigenous people, and the protracted discussions over land claims and a new constitutional status were accompanied by public support for Indigenous claims. Today Indigenous people still suffer psychologically from the effects of historical wrongs. Many also still encounter prejudice and discrimination in their daily lives. Indigenous culture is now celebrated fairly widely in society, a federal Truth and Reconciliation Commission	worked to redress the wrongs of residential schools, and many Indigenous peoples — including the Inuit of Nunavut, the Nisga'a of BC and the Gwich'in of the Northwest Territories	— now enjoy self-government and territorial ownership within the Canadian nation. How Canadian society treats its ethnic minorities is based in part on expectations about what should happen to minorities or immigrants. Assimilationists expect that all people should fuse in a cultural "melting pot." Pluralists, on the other hand, see differentiation as the legitimate right of minorities. Questions arise about the rights of members of a society to extend their political and religious diversity to ethnic pluralism. In Canada such a legal right had been originally extended to the two founding peoples (British and French). By 1982 the Charter of Rights and Freedoms extended equality and freedoms to others as well. In 1991, the Angus Reid polling organization asked Canadians to what extent they favoured diversity. A majority said they favoured a federal policy that promotes and ensures equality, eliminates racial discrimination in education, health care and the justice system, helps police improve services and helps new immigrants acquire the skills to integrate into the economy and society. The Ethnic Diversity Survey (2003), conducted by Statistics Canada, studied the ethnic and cultural backgrounds of people in Canada. It reported that 93 per cent of Canadians had never, or rarely, experienced discrimination or unfair treatment because of their ethno-cultural characteristics. However, of those who did report discrimination, the respondents were more likely to be visible minorities, and were more likely to be recent immigrants rather than second and third generation Canadians. Numerous studies concerning sexual orientation, gender, racism, human rights, Indigenous rights, ethnicity and justice have also been published since 2000. Before the 1990s, Canadian society was overwhelmingly comprised of individuals of white European descent. By 2001 the proportion of visible minorities had increased to 13.4 per cent, and by 2006 visible minorities comprised 16.2 per cent of the population. In 2011, the National Household Survey showed that 19 per cent of Canadians were visible minorities — with about 14.4 million people expected to be visible minorities by 2031. Inside Hockey - Herbert Carnegie InterviewInterview with prominent hockey player Herbert Carnegie who reveals the enduring emotional scars that came from the racial prejudice he experienced in his hockey career. A CBC video (on YouTube). Canadian Human Rights CommissionThe official site of the Canadian Human Rights Commission. The Canadian Human Rights Commission administers the Canadian Human Rights Act and is responsible for ensuring compliance with the Employment Equity Act. Both laws ensure that the principles of equal opportunity and non-discrimination are followed in all areas of federal jurisdiction. Komagata MaruInteractive website with extensive resources about the tragic Komagata Maru incident in 1914. From Simon Fraser University. Racial discrimination, race and racismConcise fact sheet on racism issues from the Ontario Human Rights Commission.